Think about a resort, or how it feels to be in a really nice swimming pool in a really nice hotel. Why shouldn’t you live that way at home? Even though it’s hot and buggy here, people in Nashville entertain outdoors a lot. It seems everyone wants an outdoor living space now. That could look like one of many things—a front porch or a rooftop, a courtyard or a back patio, or all of the above. Architecturally these spaces can be very significant to the house, but they also contribute to resale value. Pretty recently Bynum Residential Design created a dramatic formal garden for a client with a fountain and a fireplace and a mirror and a chandelier and a swing bed; we’re excited to share those on our blog soon. In the meantime, I’m sharing some of my favorite ideas and thoughts for creating a haven around your own home. 1. Express yourself outdoors as well as in. 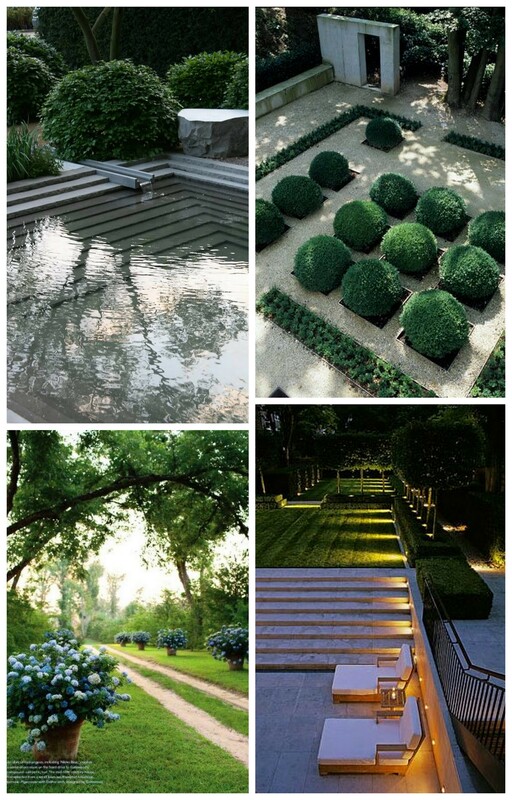 Communicate your tastes with landscaping, just as you do with your interiors; an outdoor space can feel lonely and haunting, minimalist and chic, or hidden away but bursting with activity, like a secret garden. 2. Think dimensionally. A few years ago, I had an epiphany about outdoor living spaces that has since made creating them so much more fun. I realized that a backyard didn’t have to be just about walking out onto a flat terrace. It could be on levels and incorporate different materials. Not only are these spaces more wonderful while you’re walking around them, but they’re wonderful to view from above. 4. Take inspiration from enormous spaces. In Paris all the trees along the Champs Elysees are pruned into squares. There are hundreds and thousands of them, and they look like big ice cubes. They’re stunning. I’m also a huge fan of elaborate hedge mazes. What fun is a maze! It’s elegant and formal. Just because you have a tiny urban backyard does not mean you can’t incorporate grandiose elements from your favorite parks and public spaces. One of my favorite things to do is to cloud prune boxwoods to create big, round, poufy shrubs that add a sculptural touch. And even if you just create a short boxwood maze for kids that you can look down on from an upstairs space, you’ve added so much whimsy and grace. 5. Add shape and texture. 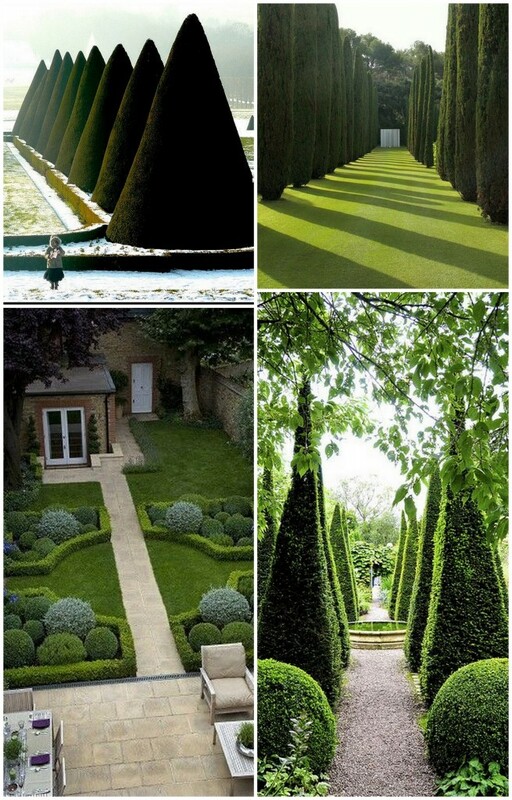 Another thing I’m crazy about: topiaries and shapes of all kind in a yard. Beyond plants, I like using concrete balls or squares of concrete to create a Flintstones-inspired floor. For pathways, I prefer a really fine crushed gravel because it’s such a pretty juxtaposition to a manicured lawn or a concrete walk. Plus it adds texture, and it’s always more fun to have different textures and materials and make them relate to one another. 6. Beyond plants, add favorite objects. I love to add old, old elements to a landscape—concrete urns and finials, for instance. A rusty bench. I also love curtains in outdoor spaces. It’s just amazing how you can define a space with objects like these. 7. My favorite plants. I’m funny about plants. I love boxwoods and arborvitaes and hydrangeas, and that’s just about it. Those are my go-tos. A lot of people here use ornamental grasses, but I feel like those don’t really belong in our part of the country. The coolest thing to me about planting is using a combination of deciduous (lose their leaves) and non-deciduous (don’t lose their leaves) shrubs. I like to use them all because some have a wild appearance and some you can shape, as I like to do with those perfectly round boxwood balls in the wintertime. It’s amazing to see the juxtaposition of those formal elements covered in snow next to something that’s twiggy and missing all of its foliage. 8. Embrace Mother Nature’s hand in the design. When choosing what to plant, think about shadows and mist and fallen snow and how the feel and function of your outdoor oasis will change through the seasons. In all seasons the yards with both deciduous and non-deciduous shrubs are the prettiest, as there’s nothing like a snowfall or a hard frost on all those plants. Oh, it’s just magic. 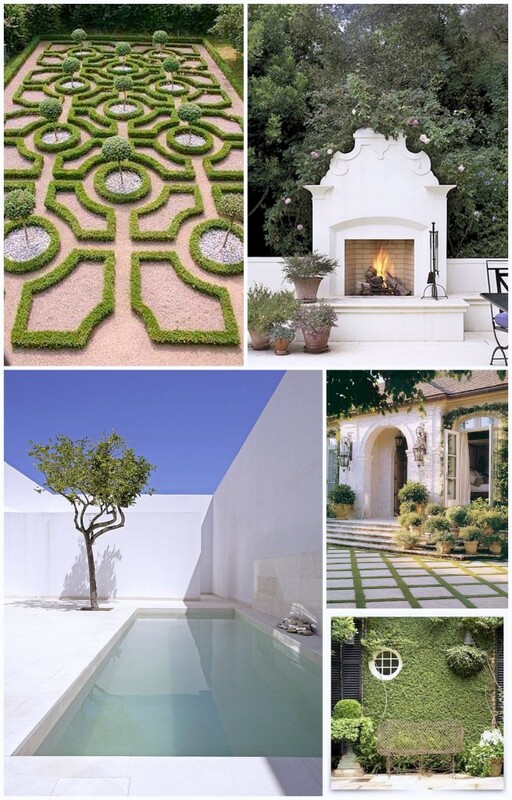 For more outdoor living inspiration, see Bynum Design’s Outdoor Living Pinterest board. This entry was posted in Tips and Tricks and tagged fall landscaping, outdoor living, outdoor living ideas on September 27, 2014 by Ellen Barnes. 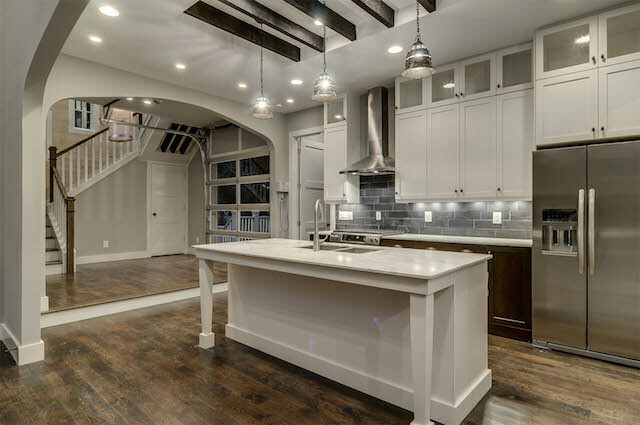 When, a few years ago, we kept coming across garage doors inside hotels during our travels–and, locally, inside restaurants, we got to dreaming about installing a garage door in an unconventional way—in a residential interior space. You’ll let gobs of light in. Hello, beautiful sunlight every single day. Even when your garage door is closed, you can enjoy all the light that it allows to pour in. And a garage door can prove to be the perfect vantage point from which to watch a sunrise, sunset, thunderstorm, or snow shower. Window coverings are a challenge. When it comes to window coverings, you’re certain to run into all kinds of problems accommodating a garage door. You can’t hang draperies in front of them; instead you have to rig something else—a roller shade could work. Nevertheless, protecting privacy can prove to be challenging. The power button isn’t pretty. Most of these garage doors come with a gigantic power button and some other bulky metal mechanisms that can’t really be prettied-up. Homeowners have to live with—and preferably dig—the industrial vibe this contributes to. Many of our spaces are a cross between industrial and farmhouse and modern, so it works fine. A wooden garage door would probably be better suited for a traditional home. Your utility bill may not be pretty either. Obviously, having a garage door open to the outside doesn’t exactly promote energy efficiency. So if you’re going to roll your door up when you have company over, you pretty much have to make up your mind to just enjoy the juxtaposition between hot outside and cool inside; I like to think it’s kind of like being at the ocean, when you get both hot and cold currents. You may choose to install blower fans to keep hot air out of the home—I’ve seen that done at restaurants—but they’re loud. We recommend installing insulated doors to eliminate drafts during colder months when your door is kept shut. You can temporarily “take a wall down.” There’s no other way I’ve found to visually—and literally—open up a space so quickly and so dramatically. Safety may be a concern with children. For homeowners with children, we’ve had some concern about how safe these doors may be. They come with backstops, but that doesn’t always assuage the worry satisfactorily. 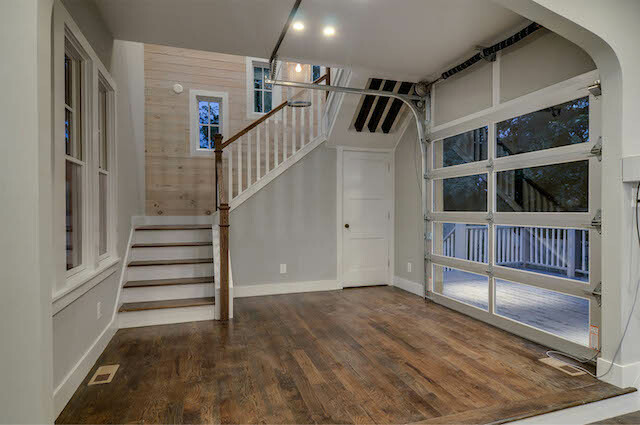 One of our clients ultimately decided to remove the garage door from her home and install French doors instead so she wouldn’t have to worry about her young son being near it. 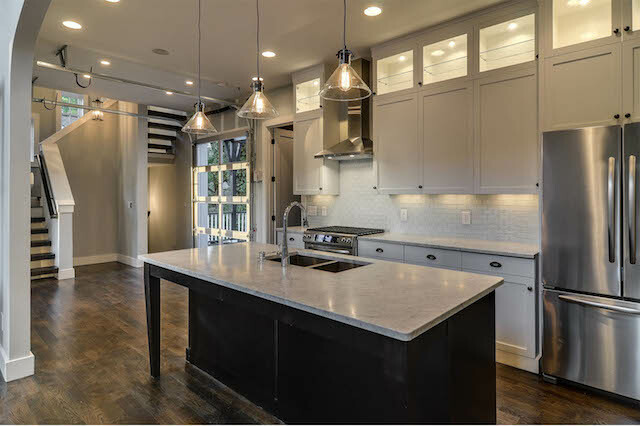 Expense and construction concerns: Creating a nontraditional opening can mean added expense, especially in an existing home. Writing this into the plans for a new home, right from the get-go, may mitigate this. We’ve also run into some engineering/constructional concerns, as extra space is required for clearance where the door needs to align with the ceiling when opened. In other words, expect that your request for an interior garage door may present your contractor with some problems that may require creative thinking to solve. Add value to your home: A garage door is such a chic and desirable feature inside modern homes that adding one to your house is almost certain to boost your home’s value and increase its curb appeal. Do you see any other pros or cons inherent to this trend? Tell us in the comments. This entry was posted in Tips and Tricks and tagged garage doors, garage doors inside, home trends, nashville garage doors on September 11, 2014 by Ellen Barnes.